USA Women’s World Cup preview: Three years after Pia Sundhage’s departure, USWNT is still seeking consistency. Nearly three years after the Swede’s departure, the USWNT still seeks the consistency of the Sundhage era. Abby Wambach celebrates her second goal against Ireland during a friendly match on May 10, 2015, at Avaya Stadium in San Jose. The U.S. won 3–0. This story originally appeared in the new issue of Howler, a magazine about soccer. Order the summer 2015 issue here and follow @whatahowler on Twitter and Instagram for coverage of the Women’s World Cup. Any candid assessment of the U.S. women’s national team since former coach Pia Sundhage left in 2012 would have to conclude that the side has failed to attain a consistent operating status. Sundhage was criticized for a seeming unwillingness to evaluate and develop new players, but her stable squad selection and direct playing style provided a sense of continuity and familiarity for the team. The former Sweden international took charge of the USWNT after Greg Ryan was let go following a calamitous 2007 Women’s World Cup. Before the 2007 semifinal against Brazil, Ryan benched goalkeeper Hope Solo in favor of veteran Briana Scurry, and the U.S. lost 4–0. The embarrassment of the defeat—the worst loss in team history—was compounded when Solo spoke out against her benching, and Ryan reacted by preventing her from joining the team for the consolation game against Norway. Such was the state of the team when Sundhage took the reins in October 2007. Her calm demeanor and willingness to help resolve internal conflicts—not to mention her penchant for breaking into song at every opportunity—patched the group back together and helped lead it to the 2008 Olympic gold medal. From there, Sundhage stuck with the same tactics and the same players during her four-year span as coach. Sundhage’s team produced results when it mattered most, finishing second at the 2011 World Cup and repeating as Olympic champs in 2012. She stepped down as U.S. coach after the London Games—announcing the decision by crooning a few lines of Bob Dylan’s “If Not for You”—and returned to Sweden, where she’s the current women’s national team coach. U.S. Soccer Federation appointed Tom Sermanni of Scotland to take her place. Sermanni had coached in the Women’s United Soccer Association and had managed Australia from 2005 to 2012. Sermanni called in more young U.S. players than his predecessor. He experimented not only with his squad selection but also with the team’s system. During his 16 months as head coach, he capped 12 new players (by comparison, Sundhage capped just 17 new ones in five years) and employed a new starting lineup for most matches. His overall record of 18–2–4 (.833) was certainly respectable and comparable to the winning percentages of Sundhage (.897) and Ryan (.900), who along with Tony DiCicco (.899) are the winningest coaches in the program’s history. But two consecutive losses at the 2014 Algarve Cup snapped a 43-game unbeaten streak, and Sermanni was dismissed a few weeks later. The announcement came late on a Sunday evening in the middle of a two-game friendly series against China. USSF President Sunil Gulati offered little in the way of specific reasons for the decision. He said Sermanni’s dismissal wasn’t just a result of the two losses in the previous month but had to do with Sermanni’s overall vision for the program. Gulati also said that Sermanni wasn’t a good fit, culturally, for the team. Whatever the reasons, the decision was unexpected, and it reintroduced the chaos and uncertainty of the late Ryan era to the USWNT. Between Sundhage’s departure in late 2012 and Sermanni’s introduction in January 2013, USSF tapped its development director, Jill Ellis, a former assistant to Sundhage, to lead the team on an interim basis. The federation did so again after Sermanni’s dismissal, but this time, the interim label transformed into a permanent title as head coach of the USWNT. Ellis brought much that Sermanni had lacked: familiarity with USSF, contentment with the existing talent pool, and a long history with many of the players. She restored much of Sundhage’s mark on the team, including a focus on narrowing down a starting 11 that featured nearly all veterans. There were far fewer call-ups for younger players such as Erika Tymrak, Sarah Killion, Julie Johnston, and Crystal Dunn—all of whom had seemed poised to break into the team on a regular basis. Ellis has focused her experimentation primarily on tactical formations, toggling between a 4-3-3 and a 4-2-2-2, though she prefers to refer to players by role rather than describe tactical formations. 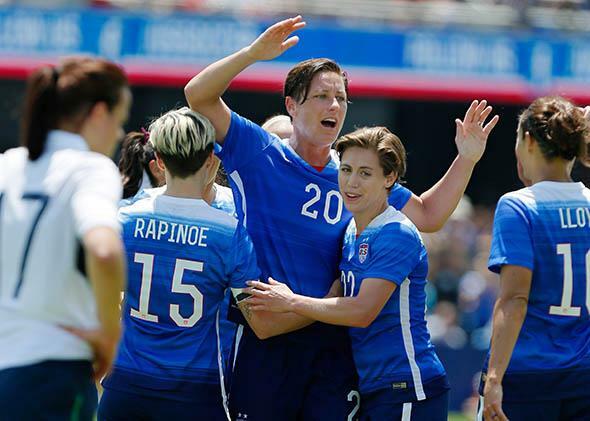 She has tried playmaker Lauren Holiday in the No. 6 role and experimented with both Megan Rapinoe and Abby Wambach in the No. 10 spot. Ellis’ tinkering has yet to yield any measurable progress, and the team finished 2014 and began 2015 on uneven notes, losing 3–2 to Brazil and 2–0 to France before eking out a 1–0 win over England. Performances, however, have yet to bear out any of those talking points. It’s never a good idea to read too much into friendlies during the buildup to a major tournament, and some key players, such as Wambach and Alex Morgan, were still rounding into form, but the U.S. has looked like a team with plenty of work to do if it is going to capture the trophy the program has been doggedly pursuing for the past 16 years.